Welcome to the Rain Rain Go Away Giveaway Blog Hop, hosted by The Kids Did It and The Mommy Island. 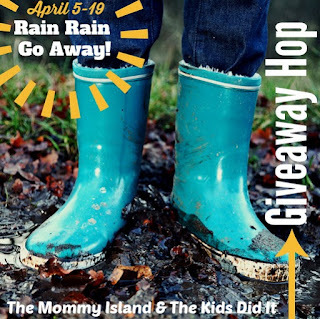 There are over 100 bloggers participating in this event, each with their own giveaway. So, after entering mine, be sure to check out all the others. 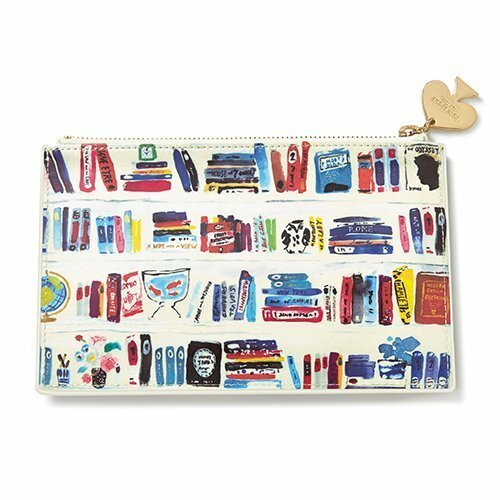 For my prize, I am giving away a Kate Spade New York Bella Bookshelf Pencil Pouch. I like nice rain storms. I do not like loud storms with thunder and terrible wind. I don't mind the rain. It is the wind that scares me. Great timing on this question as we sit under a tornado watch all day here in the South. They actually closed schools in 10 counties for fear of the weather today. Welcome to the South in April. No! I hate the rain in the winter. My cats hate it also. I'm a fan as long as I'm safe and dry in a warm house or a car, but I'm scared of lightening if I'm outside! Rain and storms do not bother me, unless they are harboring damaging winds and tornadoes! I do like like the rain and even the thunder. I have some great memories playing in the rain with my dad and now that's i have kids I've made memories with them. When i lived in Indiana i loved the loud thunderstorms we would have. I hate storms. They're getting worse around here every year it seems like. I love a good thunder and lightning storm. If it's a good storm, we'll hang out by the big bay window and watch while we stay dry. It's really cool if you can be outside and watch the storm come in. I remember one day, the rain was pouring in the pond and it was dry right next to me. Didn't last long though and the downfall finally got me - but it was beautiful! I like the rain and lightning but not the threat of tornados--we are under a severe storm warning in this area right now. I also don't like how storms scare my kids even though I try to act like they are no big deal. Love/hate relationship! I love to see and hear the rain, but dont like the lightning and wind. If you omit the high winds, I love a gentle rain and I'm not bothered by thunder and lightning. I love thunder storms! I don't I don't like the lightning though. I do like when it's thunder and lightning outside. I like seeing and hearing it. I am a fan of storms. I love the weather during that time. One recent storm did actually destory our trampoline. I like the lightning but I hate the thunder! I like storms when I'm home curled up under a blanket. Don't like storms if I have to drive somewhere. No...I don't like storm. I hate lightening....especially in the middle of the night. I'm okay with them as long as they don't cause damage. I like storms. Maybe it is because it is a rare occurrence. Growing up in Daytona Beach, I loved sitting on the front porch watching the lightning storms out over the ocean. Now tho, having moved to Georgia, not so much when the lightning is striking all around from violent thunderstorms & the house is shaking on the foundation. I do not like storms at all. My husband and 2 kids will be out on the back porch watching the rain and lightning while I am inside hiding under a blanket! I am definitely not a fan of storms, though I do like the way the air feels after it has gone away and all is calm again. I do not like storms. I am not a fan of thunder storms! Yes, I like storms. They scare me, but I like them. Yes, my dream is to spot a tornado! I am a fan of storms as long as they happen during the daytime! I don't mind them, but my sinuses and asthma hate them. I dont mind them! Thanks so much for the chances to win. I love thunderstorms! It has been so long since we have had one I can't wait until we get one. I like lightening and thunder. We don't get them much. I love storms! I love the rain,thunder and lightening! We're getting lots of rain here in not so sunny California. I don't like storms because when I was a child my house lost windows in the middle of the night and the thunder would scare my mom but I love the sounds of the rain at night. I have enjoyed watching storms from the window when I feel I'm safe inside. I love thunderstorms! They are very calming. As a child I did not like them but as an adult they are fine. I like storms, just so I am safe inside. I don't mind storms usually - it can be kind of relaxing! I love thunderstorms. I fall asleep to the sound every night with my sound machine. I like light and steady rain storms. No high winds, lightning and thunder. I like snow storms not much of thunder and ligthning storms. Yes!! I love the lightening in a big rain storm. We have monsoon season here and it is so cool. Small storms I like. But huge thunder and lightning I am not a fan. I like storms as long as I am inside. I love summer rain storms. I love watching the lightning as long as it's far enough away. I like storms when they aren't severe. I'm not really a fan of storms. I'm a fan! I like to curl up in bed with a good book during a storm. A little lightning and thunder is ok with me, but not the bad storms. I love storms...up until the tornado warnings start... then it's not so fun anymore. Love thunder. Not so crazy about lightning. Yes, I love to listen to storms. It is actually storming right now. Not a fan. I use to be till I moved and had terrible storm where lightning struck the house was so loud and blew out the tv. I don't mind storms as long as I don't have to go out in it, if I can stay home I love storms. I like gentle storms, not lightning and thunder, but a nice rain. I like the rain and thunder. I love to watch lightening storms too. As long as I'm in a safe place and with my husband, I don't mind them. I love hard rain, and storms! I find them to be relaxing and exhilarating all at once! the whistling winds, loud thunder, and bright lightning flashes! I like storms when I'm able to stay home and not go anywhere. I love storms as long as I am home. I love listening to a storm when I'm trying to get to sleep. Thanks for the chance. I do.. they smell great and they are awesome to sit and watch. As long as I have power and I'm not outside in it driving or standing it, I'm fine with storms. yes, love storms, the kids really do as well. We rarely get thunder storms where I live but I really enjoy them when they do come. We love storms and look forward to them most of the time. I like night time storms. I do not mind them. I love the thunderstorms but they always scared our dog! I am a huge fan of storms. I live in an area that has rain quite often and I LOVE storms. I especially love to sleep when there is a storm raging! I like storms at night. I don't mind a good storm now and then! Hate the damage they cause but sometimes I love to listen to the rain coming down. I like storms, especially Snow Storms, as longs as I am safe and warm at home. I actually do like storms. Nothing severe of course. But I like sitting out on my front porch when there is a thunder storm. And I love being warm & cozy inside during a rain or snow storm. I don't mind storms. They can cool down the temperature during the summer. I like a good rain storm, just not a hurricane. I love thunder storms at night. I love going to sleep to the sound of rain and thunder! I don't like storms at all. I much prefer nice weather! Warm and sunny, please! Everyone in my family loves storms. When my kids were little the tornado sirens went off my kids were outside watching the sky. When other kids were playing video games my boys played storm chaser. They grew up to be meteorologists. I love a good thunderstorm for sleeping. I am a fan of thunderstorms. I guess living in the South you get use to them. I don't like them because they scare my dogs. I am not a fan of storms, but I don't really mind them either, as long as I don't have to be out in them. Storms are ok, but honestly I get a headache everytime it rains. If I'm in the right mood, I love storms. As long as we are not in a tornado situation, I do enjoy rain and thunder. I enjoy the entertainment of thunder and lightening as long as there is not damage to life or property. I am a fan of storms only from the inside looking out! I would rather sunny weather. But I don't mind storms so much as long as I am inside! I don't mind a mild storm if it's not too wild, and I have a good place to shelter. A little rain is ok, but a heavy storm isn't fun.